Those who think that vegetarian and vegan cuisine is limited because of its culinary abstentions, such as no meat products, should check out the menu of Green Leaf. 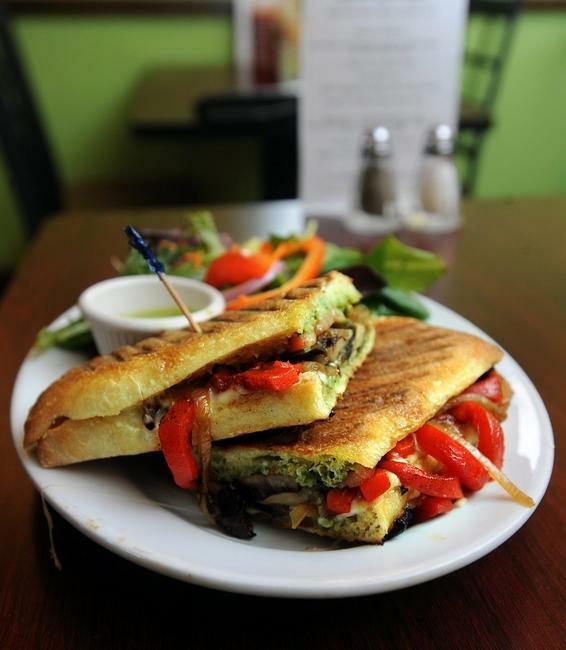 The variety, not to mention the creativity on display at this Framingham restaurant, should impress any foodie. Soups feature French lentil (cup, $4.50, bowl $5.50), arame and pinto bean and the soup of the day. All the soups are vegan and gluten-free, and served with locally made Iggy’s bread. The menu also showcases nine different salads, including sesame and cilantro rice vermicelli ($8.50). Appetizers also number nine and include artichoke stuffed mushrooms ($8.99). Lunch entrees number nine as well and include a grilled yucca quesadilla ($10), served with a choice of house salad, sweet potato fries or corn chips. Gluten-free bread can be substituted on any sandwich or burger for 75 cents extra. The burger, by the way, is made from beets. Dinner entrees number lucky 13 and include a hefty-sized potato leek pizza ($12.50) that’s easily big enough for two. The pizzas are available gluten-free for $3 extra and can also be made with vegan cheese for $2 extra. Brunch, which runs from 9 a.m. to 4 p.m. Saturdays and Sundays, offers 18 choices, including cinnamon walnut fig waffles ($9). Side dishes number 19 and include organic millet tabouleh ($2). The price range for salads is $7 to $9, appetizers $6.50 to $9.50, lunch entrees $8.50 to $12, dinner entrees $10 to $15.99 and brunch $7.50 to $9.50. There’s also a children’s menu, beverages, including fresh juices and smoothies, and homemade vegan desserts. 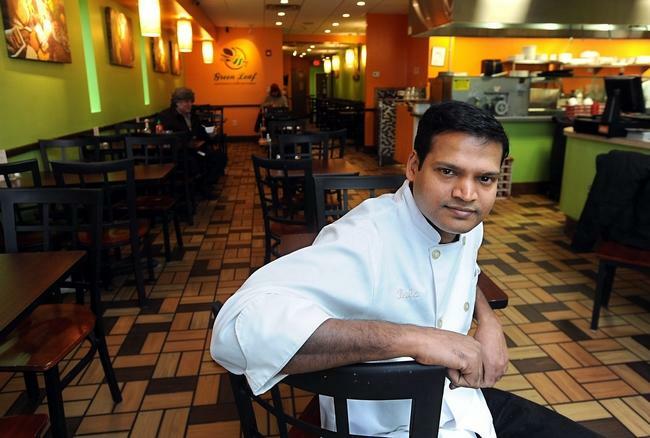 The chef cooking up all these dishes is Bala Shanmugam, formerly of Red Lentil in Watertown, who co-owns Green Leaf with Gopal Krishanasmy, who also owns Dosa Temple in Ashland. The restaurant celebrates its first anniversary this month. 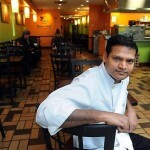 A Framingham resident, Shanmugam recently discussed Green Leaf with Daily News staff Bob Tremblay. QUESTION: How did you come up with the name? ANSWER: I believe the name Green Leaf goes well with the concept of health, and green leaves are a sign of healthy foods. Q: Why did you open this restaurant? A: We started the restaurant because we wanted to create something to show that everyone can enjoy and benefit from healthy food, which meant making alternative choices that also taste delicious. 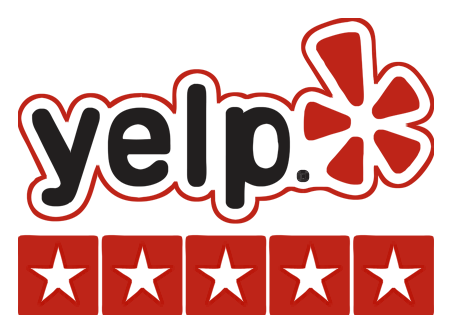 A: The cuisine has an international flare mixed with vegan and vegetarianism. Q: What makes you different from the competition? A: There is no competition in this area. New guests come in all the time interested in eating healthier and having vegetable-enriched dishes. We just want to serve healthy and good-tasting food to the public. Q: Do you have liquor license? A: We do not serve alcohol at this time, but it is a definite possibility for the future. 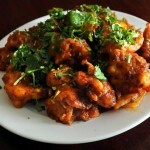 A: I grew up in southern India where, as a chef, I specialized in baking and confectionery dishes. Q: How big is the restaurant? A: It has 2,000-by-250 square feet and seats 62 people maximum. A: Green Leaf’s atmosphere is bright and inviting, representing a sunny day that will provide bountiful fruits and greens. A: They are Monday through Thursday 11 a.m. to 9:30 p.m., Friday 11 a.m. to 10 p.m. and for brunch 9 a.m. to 4 p.m. Saturday and Sunday. Saturday evening is open for dinner from 5 to 10 while Sunday evening is open for dinner from 5 to 9:30. Q: What is your signature dish? And what are your most popular dishes? 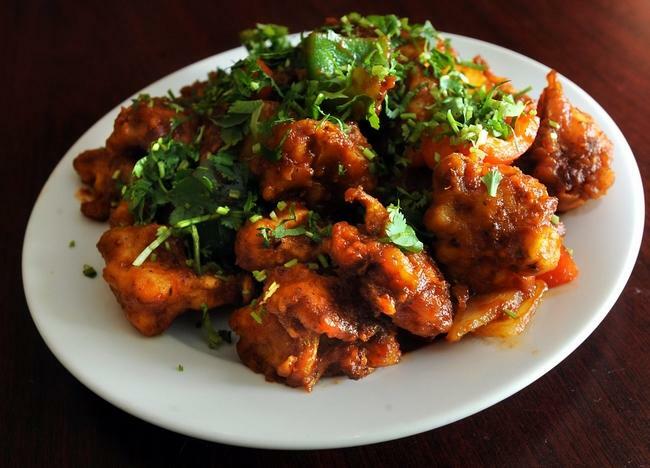 A: My signature dish is the Gobi Manchurian appetizer – chickpea flour-battered cauliflower, fried and then tossed in a spicy and sweet tomato sauce with sautéed peppers and onions, and topped with cilantro, for $9. The most popular dishes are the vegan and gluten-free enchiladas and the potato leek pizza – red bliss potatoes, grilled leeks, goat cheese, caramelized onions and mozzarella on a grilled thin crust, drizzled with basil pesto. 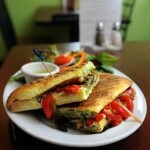 Green Leaf Vegetarian & Vegan Restaurants is at 665 Cochituate Road (Rte. 30, across from the Red Roof Inn), Framingham. Its website is www.greenleafveg.com. This entry was posted in News + Reviews. Bookmark the permalink. Copyright 2018 © Green Leaf Vegetarian and Vegan Restaurant.